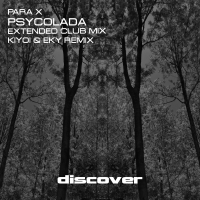 Currently riding high in the coolest charts with his debut album Rising Star, Discover Records are proud to release the full length club version of Psycolada for the first time. Using the album to explore various different styles, Para X flexes his Psy influenced muscles here, giving proof, if ever proof were needed that he is a multi genre artist of the highest calibre. Also currently riding high in various download charts across the globe with their current single - Silverdown, Kiyoi and Eky are unleashed on remixed duty here and they toughen things right up in theor own unique style.